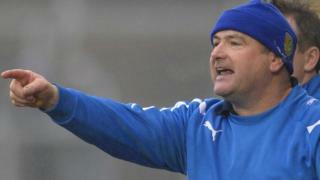 Ballinderry boss Martin McKinless speaks to Radio Ulster's Mark Sidebottom immediately after his side's win in the final of the Ulster Senior Club Football Championship. The Derry side beat Glenswilly of Donegal 1-13 to 2-6 in an exciting, attacking clash at Healy Park, Omagh. "The match swung to and fro but my boys dug in deep and got the result," said the winning manager.